Republican senators Tim Scott (S.C.) and Ben Sasse (Neb.) have announced companion legislation to a House measure that would expand school choice for military families in an attempt to ease the strain of frequent relocations. The bill, first introduced last week by Rep. Jim Banks (R., Ind. ), would set up education savings accounts for parents in the armed forces who could divert a portion of funds that would have been sent to a public school on their child's behalf under the federal Impact Aid program to different schooling options. Military families could use their education savings account to pay for educational expenses such as private school tuition, textbooks, online courses, tutoring, and other associated costs. Parents each year could roll over any unspent funds and into college savings accounts when their child graduates from high school. "As someone with two brothers who served long, distinguished careers in our military, I have seen firsthand the daily sacrifices our service members make on behalf of their nation," Scott told the Washington Free Beacon. "It should be our responsibility to take care of them and their families whenever possible. A great way to pay-it-forward is to make sure our military youth have the best academic options at their disposal." 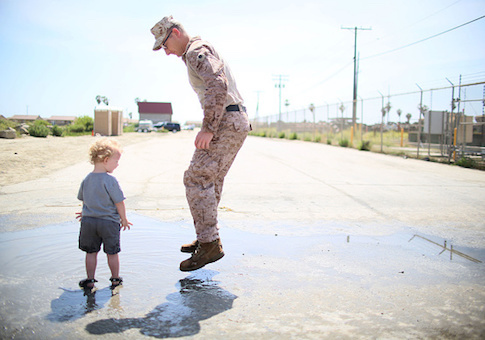 Roughly 1.82 million American kids have a parent serving in the military and will likely move six to nine times during their school career, according to the latest numbers published by the Pentagon. Scott noted that about 50 percent of those students live in states with no school choice options. A 2017 Military Times survey demonstrated the importance of educational opportunities to military families. Over a third of service members said dissatisfaction with a child's education is a significant factor in determining whether to remain in the military, while 40 percent said they had either declined or would decline a career-advancing opportunity at a different base if it meant their kid would have to leave a high performing school. "This is emotional, it takes a toll on families," Banks told the Free Beacon. "We want our men and women in uniform to focus on their job and what they do, not be focused on whether or not their kids might have a good school option when they move to the next base. At the end of the day, it's a readiness issue." The measure comes as the services have struggled with low recruitment and retention rates. Banks said his legislation would boost both. "This gives service members more peace of mind that they can find other options, whether it's a private school or to offset the cost of homeschooling," he said. "It's a tremendous benefit to those families." The House bill has over three-dozen Republican cosponsors and clinched support from Education Secretary Betsey DeVos. This entry was posted in National Security and tagged Ben Sasse, Military, School Choice, Tim Scott. Bookmark the permalink.